On the 28th of August my partner and I ventured to the German city of Düsseldorf. A city I have always wanted to visit but have never had the opportunity, but now living in Europe its all a bit easier. Düsseldorf has been called ‘little Paris’ and after a few hours in this city it is so clear to see why. The city is full of culture and couture. With every city break there comes expense. This trip unlike others came to a small fee. €120 to be exact. This was for two people I must add. The cost of food includes breakfast at the number 1 hotel in Düsseldorf as well as dinner at the number 1 restaurant. I shall tease you know more and get right onto what and where we ate. We got a coach which arrives in Düsseldorf at 11:30am so breakfast wasn’t needed that day so it was straight onto lunch. We walked into the shopping district called Schadowstrasse were we found a Oeb Backerie a bakery which is in fact a chain in the city. 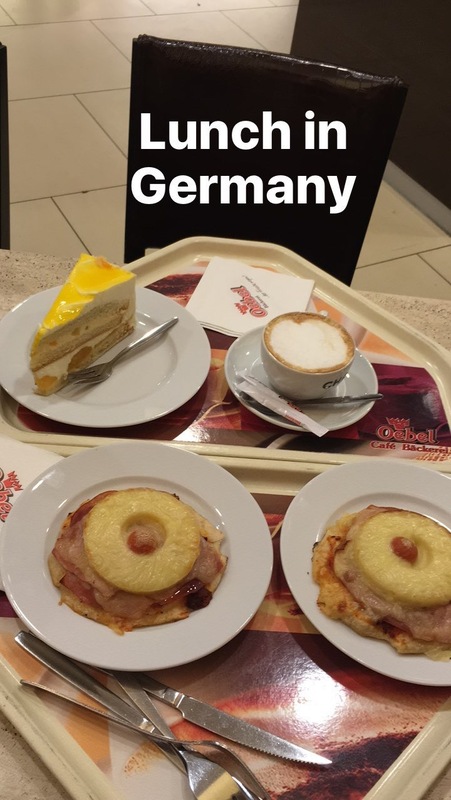 For €8.80 we were treated to a cappuccino, coca cola, tropical cheesecake and to backerpizza’s both hawaii flavoured. heese and walnut salad starter shared, a tuna and salami pizza and a meat feast pizza. Breakfast that morning was enjoyed at the hotel we stayed at for €24 we had a continental breakfast buffet which featured pastries, salmon, meats, cheeses, cereal and anything else you can think of. Whilst I understand this may not help you, I can guarentee you will be able to enjoy a large breakfast or a breakfast and lunch for €24 for 2. 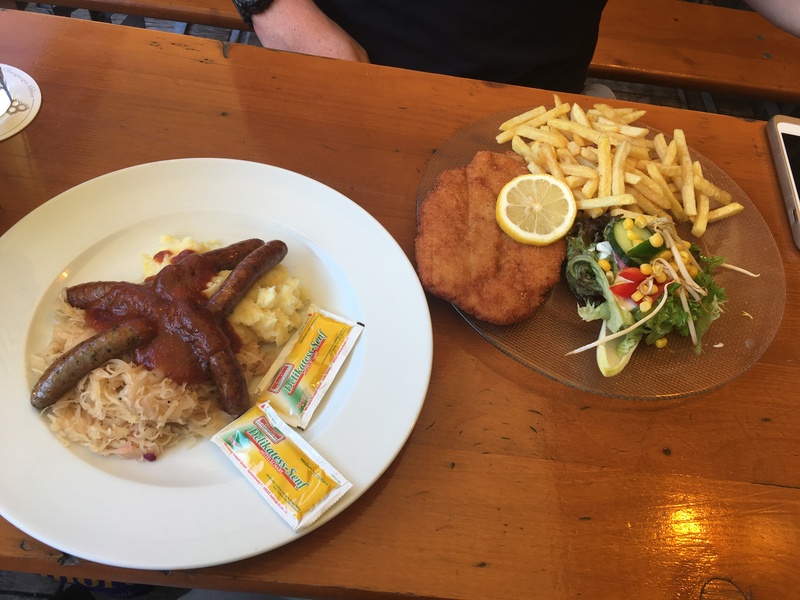 German delicacy) and mash plus a schnitzel with fries and salad. Our last meal in Düsseldorf was a large brunch in the station and an American diner. This was amazing to the point where we contemplated missing our coach home just to enjoy another burger. €24.10 at Buttershaker got us; a coffee, chocolate milkshake, 2 sesame seed bagels with bacon, eggs and cheese and a US Texas Burger filled with bacon, egg and cheese with additional fries and knoblauchmayonnaise (a delicious sauce). I must add the breakfast items (coffee and bagels) came to €7.60. There are so many amazing things to do in this city for free which you can do on foot! It’s a fabulous city to explore and enjoy, plus the food is amazing.